In December 2002, the Autodefensas Unidas de Colombia (AUC) declared a unilateral cease-fire, thus meeting a significant pre-condition for entering into formal peace talks with the Colombian government. Negotiations commenced in July 2003 in the town of Santa Fe de Ralito (Department of Cordoba). Shortly thereafter, the Colombian government announced that it had reached an agreement with AUC leaders that would result in the demobilization of its members by the end of 2005. 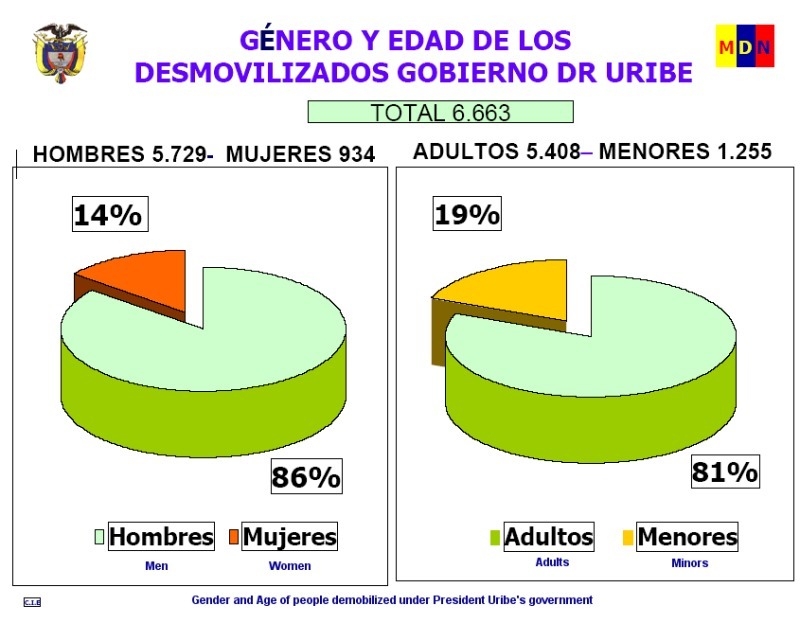 The first demobilization occured in November 2003 when 855 members of the Cacique Nutibara Bloc, which operated in Medellin (one of Colombia's largest cities), laid down their arms. 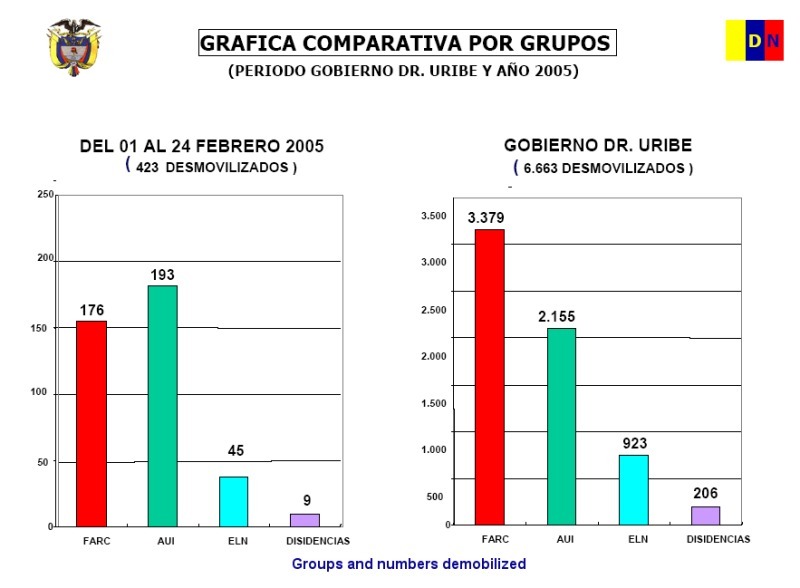 The Bananero, Cundinamarca, Catatumbo, and Calima blocs also demobilized by the end of 2004, totalling approximately 4,000 paramilitaries since the first demobilization in late 2003. 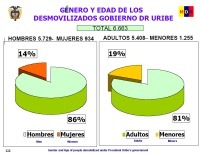 In May 2004, the Uribe administration, the AUC and Central Bolivar Bloc (BCB), a non-AUC paramilitary group, signed an accord (Ralito II) establishing a 370-square km zone (Zona de Ubicacion- ZDU) where a ten-member paramilitary negotiation commission and 400 paramilitary fighters would be concentrated. The agreement came as peace talks were deteriorating due to cease-fire violations and internal power struggles between AUC factions who support the process and those associated with narco-trafficking. Illustrating this turmoil was an April 2004 firefight at the ranch of Carlos Castano, head of the AUC, which led to his suspected execution at the hands of paramilitaries opposed to demobilization. The AUC, after an initial refusal, occupied the ZDU (located in Tierralta) when it was ensured that its protection would be provided internally by its own troops (400), and externally by the Colombian military (11th Army Brigade). In addition, the Organization of American States (OAS) has a monitoring team in the ZDU as a part of its Mission to Support the Peace Process in Colombia. In July 2004, the government and the ten-member AUC negotiation commission opened a new round of demobilization talks. As part of the government's attempt to incentivize the demobilization process, legislation has been proposed that would grant conditional amnesties to illegal combatants. The legislation has been widely criticized and seen as a violation of Colombia's committment under the International Covenant on Civil and Political Rights, which requires states to ensure that violators are brought to justice. In August 21, 2003 a bill was submitted to the Colombian legislature that would have allowed the president to determine which members of illegal armed groups would qualify for suspended sentences. Under the proposed law, combatants who qualified would have to agree to disarm, demonstrate support for the peace process, and agree to make reparations- of money or assets- to victims or into a government fund for victims. The bill was met with stiff resistance and was ultimately unsuccessful. Less than a year later (April 2004) a revised bill was introduced that would require a minimum prison sentence of between five and ten years.